Productcaster has been awarded Premium Partner status by search giant Google. The coveted Premium Partner programme recognises expertise in helping agencies and retailers reach their customers through the Google Shopping platform, and cements Productcaster’s reputation as a leading Google Comparison Shopping Service (CSS) partner. The award, which is only presented to a select few CSS partners, came as mattress manufacturing brand Eve became Productcaster’s 100th client – a key requirement for becoming an accredited Premium Partner. Productcaster founder and CEO, Hedley Aylott, said: “We’re delighted that Google has recognised us as a premium service by awarding us its coveted Premium Partner status, and we look forward to working closely with them in coming months. We’re proud of the success we’ve given our clients as we look to grow their businesses and give retailers a much-needed advantage over their competitors. 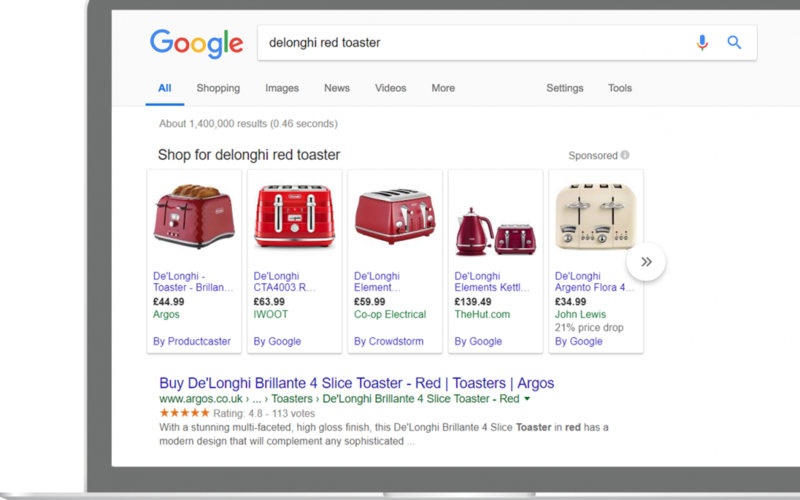 Google Shopping is a growing focus for retailers across Europe; a recent study found that 82% of retail search advertising spend goes through this channel. In order to reach their customers through Google Shopping, merchants must work with at least one CSS provider. Since its launch following the EU’s antitrust ruling against Google, Productcaster has worked with a host of leading retailers and brands in the UK and Europe, including the likes of Argos, Durex, H.Samuel and Cdiscount. Productcaster also offers a unique white label service that allows agencies to pass on favourable media rates and cost per click (CPC) fees to their own clients. Merchants and retailers who work with Productcaster will benefit from the CSS-provider’s in-depth training to help generate strong results and return on investment from the Google Shopping platform. They will also be able to take advantage of exclusive credit incentives and reduced media rates. Following the award of Premium Partner status, Productcaster continues to invest in its CSS solution with weekly releases to ensure premium service to its partners and clients. If you’re interested in learning how Productcaster can help to improve your Google Shopping performance and reduce your media fees, get in touch with our team today.